A Change At Pizza Hut..
..at the south Lansing location anyway. I was driving by yesterday and saw a crane taking signs down. I thought the worst and figured they were going out of business. When I drove by tonight, I found out that I was wrong. They didn’t close. They just changed the branding. They’ve dropped the “Italian Bistro” concept and turned it into a WingStreet. J’s been saying for a while we needed to stop in one day. Growing up, I was the only one in my family that preferred Pizza Hut. Really, I just loved the breadsticks. It’s been so long since I’ve actually had a pizza from there that I don’t really remember if I liked it or not. The Italian Bistro concept was a little more upscale than a typical Pizza Hut. They had more of a “bistro” menu and offered a lot of dishes that are now common due to the “Pasta Hut” campaign. WingStret is the Yum! Brand’s wing store. 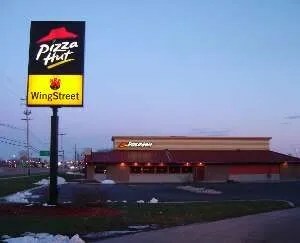 Pairing Pizza Hut and WingStreet is pretty common, but not in a location like the south Lansing spot. Usually, they’re paired together in take out restaurants. I’ve never had WingStreet wings, so maybe we’ll give them a shot one night. We’re running out of new places to eat on the southside anyway.